1) Soak Almonds in warm water for 30 minuts. 2) Then grind it to paste in a blender. 3) Dry roast rava in a non stick pan . 4) Mean While boil milk. 5) Heat nonstick pan add boiled milk then slowly add roasted rava stirring continously .Stir Continuously otherwise lumps will form. 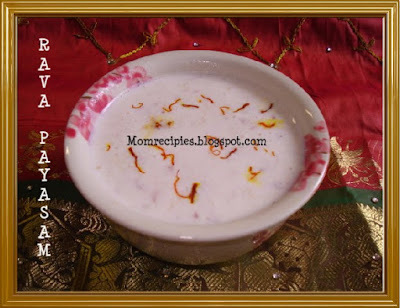 6) Add badam paste and cook on medium flame..
7) Let rava mixture cook completely for 10-15 minutes stirring occasinally so that it doesnot stick to the pan. 8) Then add sugar ,cardamom powder and saffron mixture and cook till sugar dissolves completely.Turn off stove. 9) Heat ghee in pan and roast cashwes till golden color ,remove and fry raisins.When the raisins become plump, remove them. 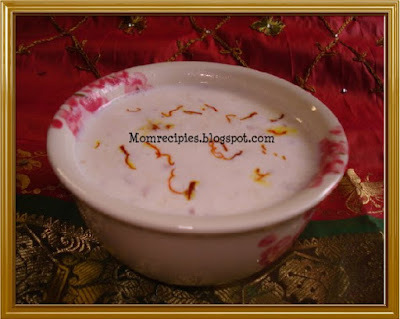 10) Add Cashews and raisins to Payasam and stir. Garnish with saffron strands. Tried out your recipe witha few changes. Came out well. I added condensed milk instead of sugar. Would like to link your post in my blog if its ok with you. Please let me know.